A new article in ‘The Australian’ exposes once again the hypocrisy of the newspaper’s editor, John Lehmann, and the shameless myth-making about climate change carried out by Dr Bjorn Lomborg. Many newspapers around the world have been duped by Dr Lomborg into believing that he is a credible commentator on climate policy. The truth is that he has a track record of churning out articles that are little more than ‘lukewarmer’ propaganda, based on demonstrable misrepresentations of scientific and economic evidence. The term ‘lukewarmer’ was invented by Viscount Ridley, an adviser to the Global Warming Policy Foundation which was set up in London by Lord Lawson to campaign against policies to reduce greenhouse gas emissions from fossil fuels. The ‘lukewarmer’ label, like ‘climate change sceptic’, is intended to make climate change denial seem respectable. Instead of rejecting the physics of the greenhouse effect, lukewarmers selectively deny any evidence that shows climate change poses serious risks to lives and livelihoods around the world. 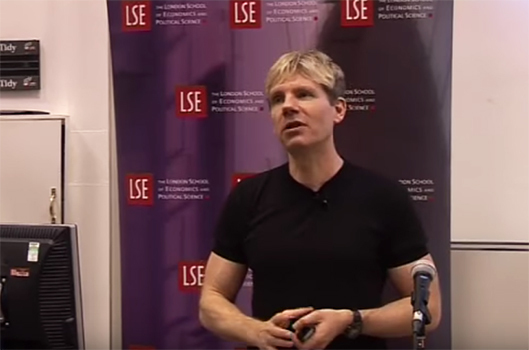 Dr Lomborg, who has a PhD on “simulating social science”, uses his latest article to repeat yet again his discredited claim that climate change can be managed solely through an increase in spending on research and development on green energy, and without any other policy measures, such as international targets for reducing emissions of greenhouse gases. Dr Lomborg’s article may appear superficially to be based on facts and evidence, but close inspection shows that it is littered with inaccurate and misleading statements. He begins by attacking the Paris Agreement on climate change because it “includes the fiction that pledges under the agreement will somehow keep the planet’s temperature rises to 2C or even 1.5C”. This is simply untrue. The Agreement indicates that “nationally determined contributions”, which were initially submitted ahead of the United Nations climate change summit in Paris in December 2015, should be revised every five years, and that these “will represent a progression over time”, implicitly acknowledging that the pledges on emissions will need to increase in ambition in order to achieve the goal, laid out in Article 2, of “[h]olding the increase in the global average temperature to well below 2°C above pre-industrial levels and pursuing efforts to limit the temperature increase to 1.5°C above pre-industrial levels, recognizing that this would significantly reduce the risks and impacts of climate change”. And the decision reached by countries alongside the Paris Agreement at the summit in 2015 stated that each Party “[n]otes with concern that the estimated aggregate greenhouse gas emission levels in 2025 and 2030 resulting from the intended nationally determined contributions do not fall within least-cost 2˚C scenarios but rather lead to a projected level of 55 gigatonnes in 2030, and also notes that much greater emission reduction efforts will be required than those associated with the intended nationally determined contributions in order to hold the increase in the global average temperature to below 2˚C above pre-industrial levels by reducing emissions to 40 gigatonnes or to 1.5˚C above pre-industrial levels by reducing to a level to be identified in the special report [by the Intergovernmental Panel on Climate Change]”. Countries are currently carrying out a collective stocktake of their ambitions, and are due to submit revised pledges ahead of the annual United Nations climate change summit in 2020. Dr Lomborg’s article goes on to claim: “The 1.5C target is a fantasy. Studies show that achieving it would require nothing less than the entire planet abandoning the use of every fossil fuel by February 7, 2021.” This is also false. The Intergovernmental Panel on Climate Change (IPCC) is preparing a special report on global warming of 1.5°C, which is due to be published in October 2018. It is reviewing published studies of the feasibility of limiting global warming to 1.5°C. Many recent academic papers have reported that the goal of limiting global warming to no more than 1.5°C can still be achieved if fossil fuel use over the course of this century can be offset by ‘negative emissions’ technologies that effectively remove carbon dioxide from the atmosphere. Dr Lomborg wrongly contends that the Paris Agreement is “not binding”. In fact, it is legally-binding for the 179 Parties that have ratified it so far, although the specific nationally determined contributions are not technically included and can be updated. He also falsely states that “even binding agreements such as the Kyoto Protocol did not hinder countries such as Canada from promising to cut emissions by 6 per cent and instead increasing them by 24 per cent”. Canada did commit through the Kyoto Protocol to reduce its annual emissions by an average of 6 per cent over the period between 2008 and 2012 compared with 1990, but Dr Lomborg neglects to mention that it withdrew in 2012. Its emissions between 2008 and 2012 were 18.5 per cent, not 24 per cent, higher than in 1990. This error is an example of Dr Lomborg’s casual disregard for facts. In addition, he ignored an analysis showing the remaining 36 countries that ratified the Protocol met their collective target for reducing emissions. Dr Lomborg’s article suggests that “the EU vowed to cut emissions to 40 per cent below its 1990 level by 2030, but as of last year had enacted policies that would reduce them by 19 per cent”. In fact, the latest assessment by the European Environment Agency found that the Member States of the European Union have already adopted and implemented measures that would result in emissions in 2030 that are 30 per cent lower than in 1990. Dr Lomborg selectively quotes from a commentary by Professor David Victor and co-authors that was published last year in the journal ‘Nature’: “Japan promised cuts in emissions to match those of its peers, but meeting the goals will cost more than the country is willing to pay”. Dr Lomborg’s biggest errors occur in his description of the economic impacts of climate change, and particularly his bogus assessment that costs of action “through carbon cuts are high and the benefits quite small”. Although Dr Lomborg does not admit it, these statements refer to a single paper by Professor Richard Tol that has been shown to contain numerous errors. Dr Lomborg does not disclose that the figures he cites refer to two data points in Professor Tol’s paper that are supposed to represent the estimated economic cost of global warming of just 1°C. The projected increase of 2.3 per cent in GDP is taken from an old paper by Professor Tol, published in 2002, which excludes many of the negative impacts of climate change, such as extreme weather, and makes exceptionally optimistic assumptions about potentially positive effects on crops of warmer temperatures and higher levels of carbon dioxide levels in the atmosphere. In fact, a failure to reduce emissions could result in global warming of much more than 3°C by the end of this century, and even higher increases in the decades and centuries beyond. The impacts of such warming could undermine economic growth altogether, making future generations poorer not richer than us. Current economic models fail to capture properly these risks, as the IPCC recognises. Next, Dr Lomborg states: “The Paris treaty, fully implemented, would achieve one-hundredth of the reduction to 2C (a level at which there are still significant impacts), and hence achieve benefits worth perhaps only one-tenth of 1 per cent of global GDP 100 years from now”. These figures are based on a paper by Dr Lomborg that has been thoroughly discredited because it assumes that countries abandon emissions reductions after 2030 and largely reverse the effects of implementing their nationally determined contributions. He goes on to cite figures for the costs of the European Union achieving its emissions reduction targets, supposedly based on the results of the Stanford Energy Modeling Forum. However, these are numbers that Dr Lomborg prepared at the behest of Republicans on the United States House of Representatives Committee on Science, Space, and Technology who oppose action on climate change. The figures bear no obvious relationship to the outputs of the Forum and Dr Lomborg has never explained how he created them. For instance, Dr Lomborg suggests that a paper by Professor Brigitte Knopf and co-authors for the Forum concluded that the cost of reducing the European Union’s annual emissions by 80 per cent by 2050 compared with 1990 would be equivalent to 11.9 per cent of its GDP. But this figure does not appear in the paper, which instead states: “Nearly all the models can achieve the long-term target of reducing GHG emissions by 80%, with only a moderate reduction in GDP (less than 0.7% by 2030 and below 2.3% by 2040)”. Finally, Dr Lomborg makes inaccurate and misleading claims about the costs of low-carbon energy. He states: “Even by 2040, and even with carbon being taxed, the International Energy Agency estimates that average coal still will be cheaper than average solar and wind energy”. Dr Lomborg does correctly suggest at the end of his article that a significant increase in investment in research and development in low-carbon energy is required to tackle climate change. Unfortunately, as with his other articles, he ignores the substantial accumulation of analysis and research that shows such expenditure alone will not be sufficient to avoid dangerous climate change. Instead, he cherry-picks evidence to suggest that the risks are not great and urgent reductions in emissions are not needed. Given the many inaccurate and misleading statements in Dr Lomborg’s article, it is perhaps puzzling that ‘The Australian’ published it. Sadly, the newspaper has shown many times before that it prefers to prevent it readers from learning the truth about climate change. Nonetheless, it is clear that News Corp, the company that owns ‘The Australian’, does not accept the climate change denial that is promoted by the newspaper. On its website, News Corp boasts of having reduced its carbon footprint by 42 per cent since 2006. Mr Lehmann obviously believes that his readers should do as he says and not as his company does.